Written by the world's foremost practitioners and instructors, this landmark reference logically progresses from basic science principles, including topics such as cells, genomics, and molecular surgery, to clinical areas such as the pancreas. Importantly, the book is carefully written to ensure that SCORE® (Surgical Council on Resident Education) topics are covered in depth and are easy to locate within the text. 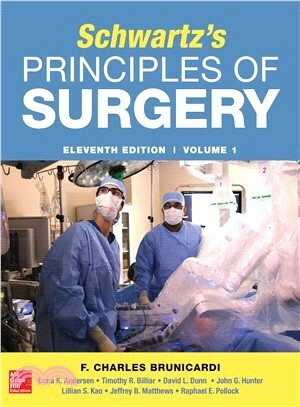 Schwartz’s Principles of Surgery, Eleventh Edition reflects a distinctly modern approach in the dissemination of surgical knowledge, providing up-to-date coverage of all key surgical areas, from trauma and transplantation, to neurosurgery. In each chapter, the content is supported by learning aids (many new to this edition) that include boxed key points, pearls and decision-making boxes, detailed anatomical figures, diagnostic and management algorithms, an abundance of completely up-to-date tables, and key references. •New chapters on Outpatient/Ambulatory Surgery (key topic for Asia market), Enhanced Recovery After Surgery (ERAS), and Skills and Simulation. F. Charles Brunicardi, MD, FACS is Chair, Department of Surgery, University of Toledo School of Medicine. Dana K. Andersen, MD, FACS is Program Director, Division of Digestive Diseases and Nutrition, National Institutes of Health. Timothy R. Billiar, MD, FACS is George Vance Foster Professor and Chair of Surgery, Department of Surgery, University of Pittsburgh School of Medicine; and Vice-President and Chief Academic Officer, University of Pittsburgh Physicians. David L. Dunn, MD, PhD, FACS is Executive Vice President for Health Affairs, University of Louisville. John G. Hunter, MD, FACS is Kenneth A.J. Mackenzie Professor, Surgery, Oregon Health & Science University; Executive Vice President, OHSU; and Chief Executive Officer, OHSU Health System. Jeffrey B. Matthews, MD, FACS is Dallas B. Phemister Professor of Surgery and Chair, Department of Surgery, University of Chicago Medicine. Raphael E. Pollock, MD, PhD, FACS is Professor and Director, Division of Surgical Oncology, The Ohio State University.